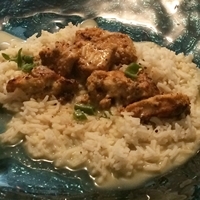 It had been a while since I had made an Indian dish for dinner, so on a recent Saturday I pulled out this recipe for black pepper-curry chicken sauté. I didn’t follow the directions, but I did use the specified seasonings: ginger, garlic, pepper, and curry powder. I omitted the cloves. Rather than preparing the spices as per the recipe, I mixed them in a bowl and then tossed the chicken pieces in the bowl. For aesthetic reasons I used white pepper instead of freshly ground black pepper. I cooked the chicken in a cast iron skilled and added the light coconut milk. I served the mixture on top of basmati rice.